This page provides brief information about the history of our community service projects. The projects are listed in order from most current project back to our first project. Please see our Activity Pictures page for images from these projects and more. Spring Garden Tours: The AGC organizes a spring garden tour every other year as a fund-raiser for our club. The tours are a great way for citizens in our community to learn about landscape design, selecting the right plants and many more ideas to create in their own landscapes. We include educational articles in our tour ticket books about insects, plant diseases and more. Tours are held on alternating years. Please see our Garden Tour link for more information. National Planting Day: The AGC has participated with this event by providing plants, seed, labor, etc. for project such as the trial gardens at the Allen Public Library, a memorial wildflower garden at Story Park, designed, coordinated the preparation and planting of the landscape at the Lynge house at the Allen Heritage Village, and worked with the Allen High School MC-JROTC to re-seed the wildflower meadow and replace the split rail fence across from Vaughan Elementary. Allen Heritage Village Gardens: AGC members assist in the the installation of new gardens and garden clean-up/maintenance of the existing gardens. We work with organizations such as the Allen High School MC-JROTC, Collin County Master Gardeners, Allen Heritage Guild, and other civic organizations to accomplish these projects. EarthFest: The Allen Garden Club has participated in EarthFest annually since 2008. The AGC offers free seeds, garden tip sheets and has hands-on crafts for the kids. EarthFest is a free environmental festival now held at Connemara. In 2012, EarthFest attracted around 2,000 visitors. Community Gardens at The Village of Fairview: The AGC rented a garden plot to grow vegetables that they will donate to local food pantries. The Village at Fairview announced they are developing the area where the community gardens are located in the next few months, so the AGC did not renew our contract. Heritage Park Playground Gardens: AGC members rescued the native plants from the Vaughan Elementary gardens in the fall of 2009 and relocated them to the gardens near the playground in the Heritage Park neighborhood. The park is located on Aylesbury Drive, south of Bethany Rd. The AGC maintains this garden as an "Adopt-a-Spot." Ford Middle School Landscape: AGC members assisted with the landscape clean up at Ford MS by directing the work of around 150 adult and student volunteers and assisted with the planting. Plants were donated by WalMart Neighborhood Market in Allen. The event was organized by members of the Ford PTA and Ford Administration. Roses at Allenwood Park: AGC members planted a variety of EarthKind™ Roses around the pavilion at the new Allenwood Park on Keith Drive in Allen during the fall of 2007. Allen Pecan Orchard: The Allen Garden Club donated funds to help plant pecan seedlings in the fall of 2006 in a new pecan orchard located in Allen Station Park. This project was originated by the Leadership Allen 2005 class. Arbor Day Celebrations: In the past we have provided funding for many of the trees and have given away soil testing kits, seed packets and raffled off prizes. In 2006, we donated a Texas redbud tree that was planted in honor of the City of Granbury as the exchange tree for the Trees Across Texas program. St. Mary's Church in Allen Heritage Village: The AGC installed a rose garden on the east side of the church with assistance from Boy Scout Troop 79 and the Allen Heritage Guild in 2004. A shade garden was installed on the west side of the church in 2003. AGC members help maintain these gardens. 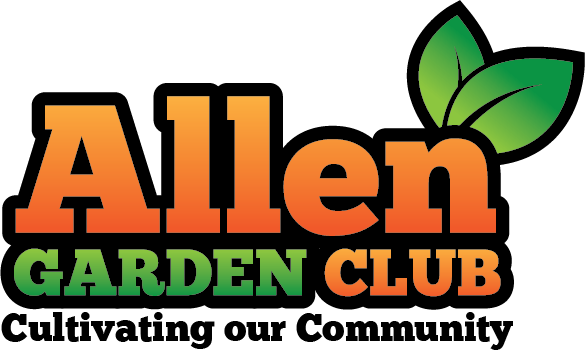 Allen Recycles Day: We have assisted local senior citizens since 2002 by planting pansies and cleaning up their landscapes, providing potted pansies to local senior. SPCA of Texas Landscaping: The Allen Garden Club collected $175 from our club funds, the Plano Garden Club and members of District X of Texas Garden Clubs that was used for the landscaping at the new SPCA in McKinney. Allen Senior Citizen's Center Landscape Project: Our 2001-2002 project cleaning up the landscape, planting shrubs, etc. to improve the landscape at the former senior center at 102 N. Allen Drive in time for their 20th anniversary. Becky Lowery Memorial Tree at Curtis Middle School 2001: Thanks to Lowe's in Allen for donating all the shrubs, edging, landscape mix and mulch for this project and to the Allen Parks and Recreation staff for assisting in the removal of the grass. The AGC members and students from Curtis Middle School helped plant shrubs and flowers that surround the Becky Lowery Memorial tree at their school. St. Jude Children's Butterfly Garden 2000: This garden was partly funded by a PETALS grant from Shell Oil Corp. and is utilized by the Rainbow Days Preschool for educational purposes. The garden is located next to the playground at St. Jude Catholic Church and maintained by members of the Allen Garden Club and is enjoyed by many children and their families. AGC members help maintain this garden. Seedling Tree Donations: The Allen Garden Club donated 130 seedling trees to City of Allen for planting in parks and medians. Allen Senior Citizens Center Gardens 1998: Members of the Allen Garden Club helped beautify the little blue house at 102 N. Allen Drive where the senior center was originally by planting pansies and tulip bulbs for cool season color. This was our first project as a club.